Over the past decade, data breaches have indiscriminately affected a diverse set of targets, spanning from technology start-ups to government organizations. The exposure of customers’ critical confidential information has crippled businesses and brands across the globe. In light of these highly publicized breaches, cyber risk has become a board-level issue, no longer delegated to operations or IT teams. 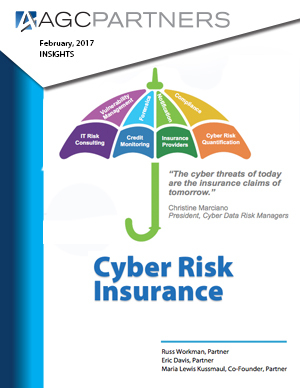 Insurance providers have moved quickly to offer coverage; however, the market’s domain knowledge in assessing cyber vulnerabilities and risk quantification has led to a thin product portfolio with disparate premiums and coverage limits. Start-ups and established corporations have rushed to provide specialized cyber risk assessment and quantification services establishing a basis for policy risk evaluation. This report takes a closer look into the market as well as companies in the ecosystem, M&A and private placement activity.